AMIA offer a range of standard shed window options to the national shed market. For a broader overview of the products we can offer, please see our Product Offering document. 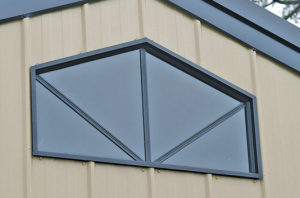 Standard cladding profiles have been measured and window widths worked out accordingly, that suit the pans or valleys of steel profiles. NOTE: Size is based on “aluminium frame” sizes excluding fin and trim beads. NOTE: The standard configuration is Right Hand Fixed when looking from the outside of the building. In our standard range we offer both clear and obscure glasses, in annealed or toughened safety glass options. Other custom options such as double-glazing, laminated, tinted, textured and low-energy glasses are also available to suit your needs. Flyscreens and Barrier Screens are available for all sliding windows and doors. These screens can be made to comply with bushfire specifications if required. Keyed locks are also available as an add-on for our sliding windows. These can be used to restrict the opening size of your windows for ventilation or child safety purposes. 23 standard colours are available to suit your individual shed design, as well as a wide variety of customised colour options. 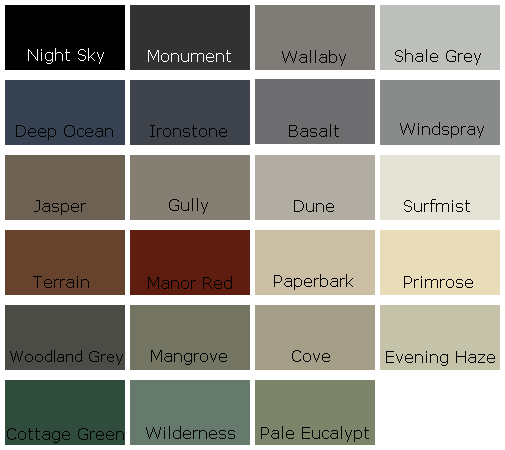 We recommend “Shale Grey” be used if you are looking for a Zincalume finish.